We are raising the bar on convenient ready-to-drink beverages. We strive to bring quality ingredients to your active lifestyle with the best of alcohol-free alternatives. We take pride in focusing on safe drinking and alcohol-free solutions. Our Friendly Bloody Mary mix is made to thrill your taste buds with more than 20 natural ingredients, nicely balanced to deliver a taste that will leave you craving more after just one sip. Don’t be fooled by the name, this Bloody Mary will wake up your mouth with a bang. It has a very unique and complex big bold flavor that is balanced with a pleasing amount of heat. You can see the spices in the bottle before you shake it up to serve, but even that doesn’t prepare you for how good this Blood Mary tastes. Sriracha Bloody Mary – NEW!!! Delicious and Bursting with the intense flavor of sriracha and loaded with an abundance of other natural ingredients blended in perfect balance! It’s tangy, it’s spicy, it’s garlicky, with just a hint of sweetness. The unique taste is addictive, and it’s made with red chili peppers that bring your taste buds to life! This newest creation pops with flavor like all SPOOKY Bloody Mary mixes, and of course it is all natural and delivers made-from-scratch taste. Check it out soon! So Good!!! It will “scare your taste buds” because it will shock your mouth into pure delight with more than 20 carefully selected natural ingredients, all mixed in perfect balance. 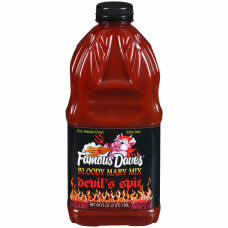 This is definitely not the typical Bloody Mary because it is packed with immense flavor and heat, and it is brimming with chuncks of spices and the perfect amount and great taste of horseradish. If you are a horseradish fan you will love the flavor, and if you are not a horseradish fan you will still love the flavor, because it the proportions are just right…..voted best tasting Bloody Mary at the 2017 International Flavor Awards! The flavor is enormous!! This amazing Bloody Mary is complex and bursting with the great smoky flavor of Chipotle, and an abundance of other perfectly balanced spices. It is deeply satisfying and it packs a big bold taste with an invigorating amount of heat that will “bring your taste buds to life!”. We’ve mastered the proportions and meticulously sourced the highest quality natural ingredients to create this unique and truly exceptional Bloody Mary. 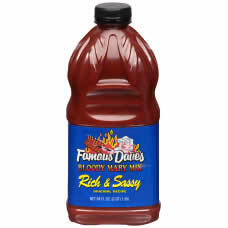 *Cook with it and all of our Bloody Mary mixes…..amazing marinade for beef, pork, chicken, ribs, and shrimp are incredible (just 15 minutes then onto the grill)! So Smooth! We created what we think, and our fans agree, is the perfect Margarita! It is 100% sweetened with Pure Blue Agave Nectar delivering very unique and fresh-made flavor, not too tart and not too sweet. This creation is smooth refreshing perfection in a glass, and we know that you will enjoy it. Made with real juices and no dye to turn it green or yellow. Even sugar sweetened premium Margaritas simply can’t compete with the flavor of this Blue Agave Nectar masterpiece! It is widely known that the Agave plant grows in tropical regions and is used to distil tequila, but people in the U.S. are just beginning to discover Agave Nectar as a natural sweetener, and at Spooky we carefully select the best pure nectar for our Margarita Mix. Combine with your favorite Blanco Tequila , experiment with Añejo Tequila, Mezcal, OR add some rum or vodka for a new twist. A true Mojito except it’s easy to make! Made with real Lime Juice, Spearmint, and Sugar………just rum and you’re done. 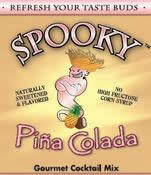 Fresh taste in seconds, and you can flavor it with our Strawberry mix, coconut or other flavored rums, or fresh fruit. If you already like Mojitos then you will probably love this one, and you’ve never had a Mojito that left you wanting more then give ours a chance. Balanced and refreshing, and oh so good! Makes an awesome Mint Julep with your favorite bourbon too! This unique and fresh-tasting blend of real juices is ideal for the beach, pool, boat, backyard, or just about anywhere else. Just add your favorite rum! This tasty treat is made with pineapple, orange, coconut, lime, raspberry and a few other natural flavors. Send your taste buds on a tropical adventure with this one-of-a-kind instant fan favorite, and explore what you have been missing. Add your favorite light rum to create the perfect Rum Runner, float dark rum on top, or mix light and dark rum together for the ideal Planters Punch. Also goes great with tequila or vodka, AND makes an awesome Tropical Mimosa! True made from scratch taste! This superb Piña Colada is rich and creamy and perfectly balanced, made with real coconut meat and real pineapple juice, and it’s naturally sweetened. You will be amazed by the natural clean and balanced flavor of this tropical favorite! Just add your favorite white rum, shake with crushed ice or blend, and your mind will instantly be transported to your favorite tropical destination! Also mix with our Strawberry mix for a spectacular Miami Vice, (if you haven’t had one you really need to try it) that will plaster a smile on your face that will not fade away any time soon. This wonderful blend of natural ingredients creates an excellent Strawberry Daiquiri (or Strawberry Margarita), using high quality natural ingredients to deliver that freshly made taste that you crave. This fruity favorite is made with real strawberry and its naturally sweetened with real sugar. We’ve mastered the proportions and fine tuned the ingredients so you can easily create awesome tasting cocktails with minimal time and effort. Simply blend with your favorite rum and you can add fresh berries too, for the perfect Daiquiri. This delightful blend of high quality natural ingredients creates the ideal Sweet & Sour mix, fresh tasting and perfectly balanced. This versatile favorite is made with real sugar and natural lemon and lime, and we never add high fructose corn syrup to our mixers and we avoid artificial colors. The possibilities are endless when combined with your favorite spirits. We’ve mastered the proportions and fine tuned the ingredients, so you can create a wide variety of awesome tasting cocktails with little effort. This naturally sweetened and naturally flavored Lime Juice delivers the pure fresh squeezed taste that is crucial to making perfect cocktails, and it is great for cooking too. This versatile favorite is made with real lime juice, and unlike the leading brand it contains no high fructose corn syrup or dye. The possibilities are endless when combined with your favorite spirits. 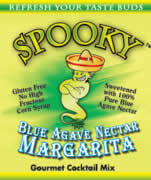 Use SPOOKY premium Lime Juice to create a wide variety of awesome tasting cocktails including the perfect Gimlet, Classic Daiquiri (rum and our mix), and many other delicious concoctions. Straight from Hell’s kitchen. So damn tasty it’s almost sinful! Only the hottest Peppers stolen from the Devil’s own backyard were used. Caution – may have aphrodisiac side effects! 64 oz. 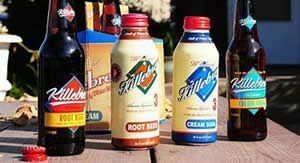 Our ingredients start with pure natural spring water flavored with real Minnesota honey, and Killebrew Root Beer and Cream Soda are quality brewed right here in the heart of the Midwest! Visit us again soon for a variety of refreshments the whole crew will love. These beverages are all about convenience for the whole family, just open and drink. Got a favorite? Contact us at contact@abwholesale.com and we will get it. If you have any questions about AB Wholesale’s line of products, including non-alcoholic beverages, craft beers, spirits, wines and specialty liquors, please fill out our contact form.